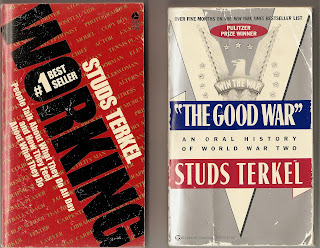 These three books by Studs Terkel will take you on a journey through 20th Century America. "Working" was originally written as a series of Occupational Interviews for the NRA Writers Project during the New Deal. Writers were sent out across America to interview people of all occupations in all areas of the country. The results are fascinating. 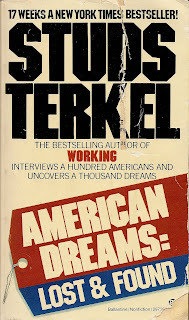 Studs Terkel is an American journalist and a treasure. At 96 he is still active and writing. His writing style in these books is to let his subjects speak. This is oral history at it's best. The next book "The Good War" is again a series of interviews with every conceivable person involved in the war. From Rosie the Riveter to the guys who flew the planes to the politicians who waged the war, it's all here. The final book of this trilogy is "American Dreams-Lost and Found" which came out towards the end of the Vietnam War. It chronicles the differences between "The Good War" and the War in Vietnam through interviews with the people who fought in it as well as the people at home who were against the war. A real journalistic approach to the conflict that divided America so deeply. It is also a foray into what Americans really expect from their government. The key to these books is that Mr. Terkel has an unusual understanding of people and how to get them to open up. Through his writing we see glimpses of other peoples lives and even come to understand our own in a more clear way. These three books will help you understand how we got where we are. They will also have you wondering where we are going.